This compilation of PaaS providers should help show what options are out there, with special considerations for built-in infrastructure and scalability services. Here, we’ve gathered together the first half of our list of the biggest players in the PaaS provider space. Stay tuned for part 2 where we’ll continue this list. Platform-as-a-Service (PaaS) gives users with the platform and the environment for them to develop, manage, and run applications over the Internet. PaaS takes away or lessens the complexities of building, maintaining, and enhancing the cloud infrastructure that developers need in order to develop and launch an app. In other words, PaaS makes higher-level programming easy for web and software developers, and ultimately for businesses. There are different kinds of PaaS providers. While they offer app hosting services or a built-in infrastructure, and deployment environment, they differ in the kind of integrations, as well as in the levels of maintenance and scalability they offer. Developers can choose a PaaS provider according to which one has the toolkit and standards that suit them, which one supports the software language they are using, and which one has the right channels for distribution. Now, the big question is: Who are the major PaaS providers and what does each of them bring to the table? To help you find the right PaaS provider for your needs, we’ve rounded up 35 of the biggest players in the space. The providers listed below are listed alphabetically for easy reference. 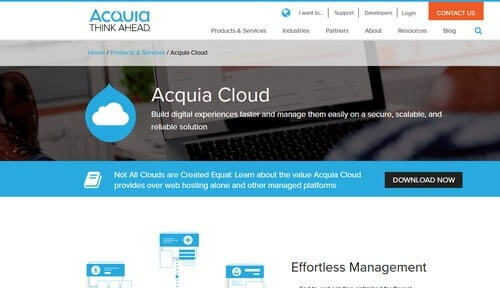 Acquia Cloud allows you to create, manage, optimize, and troubleshoot Drupal applications. It helps you accelerate deployment while also making your Drupal applications or websites resilient. It is a complete lifecycle management suite for Drupal and provides users with tools from development to production. Acquia Cloud is for every Drupal developer who wants to succeed in every step of the way: from large enterprises or professional developers to small businesses. Cost: Paid packages start at $141. Amazon Web Services (AWS) offers a variety of cloud services, including computing power, content delivery, database storage, and other as-a-service features to help your business grow. Even with its wide range of features and functionality, AWS continues to evolve and to add more. It currently has more than six dozen services, and it is still growing. Read our comparison of Azure vs. AWS to find out how the two major players stack up. Cost: On-demand and usage-based billing. Rates vary depending on the service or the features you use. Free services are available. Amazon Elastic Beanstalk gives users an easy way to deploy and provision cloud-based resources that automate setting up applications on Amazon Web Services. All you need is to upload your applications, and everything from load balancing, provisioning, application health monitoring, and auto-scaling will be handled by Amazon Elastic BeanStalk. Cost: No additional fees, but you pay for the AWS services and resources that you use to run your applications. App42 PaaS offers a hosting platform for applications written in a variety of languages, allowing you to focus on your app development and not worry about the server-side issues. It also supports a variety of services such as MySQL, MongoDB, and Couch DB, meaning you can use any type of database with it. It makes use of virtualized containers called Kontena to run your services and apps. Cost: 1 Kontena (256 MB RAM and 128 MHz CPU) costs $0.03 per hour. AppAgile provides modular PaaS platforms that give you both cloud-based development platforms and business applications. You no longer have to think about extensive integration or development. Your developers get easy access to cloud applications on a platform that is highly scalable and secure. Meanwhile, you get to save on IT infrastructure and software, and all expenditures are classified as operating expenses as you pay based on the resources you actually use. Cost: Open source and pay per use. AppFog makes it very easy to deploy your applications on a fast, multi-locale, and resilient cloud-based platform that is available to you as a service. With AppFog, you only manage your code and data, and they will take care of the rest, including runtime, middleware, operating systems, virtualization, servers, networking, and storage. That means you can focus on your application instead of, for instance, provisioning servers, or configuring Web servers, or setting up databases. Cost: $0.04 per GB per instance. 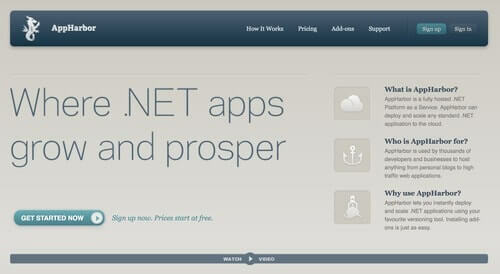 AppHarbor hosts your .NET applications on the cloud that developers and businesses can use. It enables you to scale and deploy your applications with your own versioning tools. AppHarbor also offers several add-ons that you can use with your applications. Cost: Paid plans start at $49, with a free option. Apprenda is a platform software available on the cloud that supports your current infrastructure and applications, while also giving you an easy way to get on the cloud. You can now use Apprenda to speed up the time-to-market of your new products while reducing IT costs and complexities. Cost: As of this writing, no pricing information available. AppScale lets you focus on developing your applications by using a platform that is highly similar to Google App Engine. You no longer have to worry about backend programming and configuration. With the worldwide popularity of this open-source PaaS, AppScale claims to be able to cut up to 68% of your cloud services bill and can provide environments for quick prototypes, testing, and production. Cost: Open source, with support plans, and premium services available. Bitnami enables you to host and run your applications in the cloud. You can have Bitnami stacks deployed and managed easily and quickly. 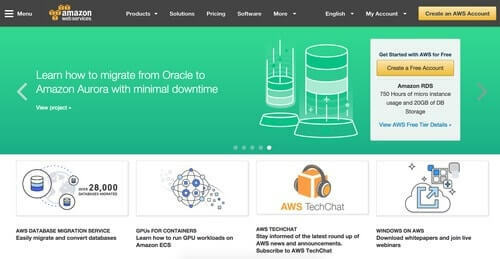 It supports different cloud platforms including Amazon Web Services, Google Cloud Platform, Microsoft Azure, and Oracle Cloud Platform. Apart from cloud services, Bitnami also gives you applications that help deliver the same experience for different users no matter what platform they use: containers, on the cloud, or with a virtual machine. Cost: Pricing for Bitnami Applications varies, with free trials available for some applications. Cloud hosting price is unavailable. IBM Bluemix is a cloud platform that brings together infrastructure, services, and data you need to help bring your business ideas and applications to production. You can manage and scale easily. You can get the tools for every IT undertaking you want, whether it is creating a new application, reworking an existing one, or upgrading your databases, you can rely on IBM Bluemix to help you. Cost: You can get started for free. Pay as you go plans or fixed monthly subscription are available. Cloud 66 provides you the tools to create, develop, deploy, and then subsequently maintain any applications using the cloud environment or server you want. Cost: Tailored pricing for different workloads is available. Projects start at $19 per project per month, while managed backups start at $0.12 per GB. Meanwhile, teams of three start at $15 per month and paid support plans start at $200. 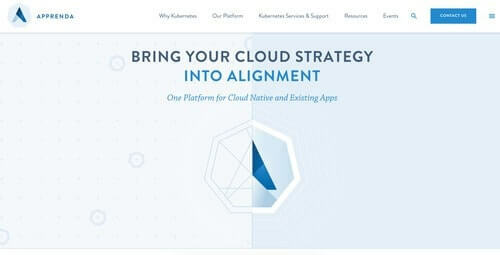 Cloud Foundry has established a global standard for open-source PaaS technology that developers can use to create, deploy, and then run their applications without fear of vendor lock-in, which is all too common with PaaS. They also provide training and certification programs for developers. Based on Jenkins, CloudBees delivers a continuous delivery platform with enterprise level security, manageability, and stability. You can also expect expert support while making your software delivery a whole lot painless. You get to be more productive, and software delivery is now less problematic and stress-free. You can now concentrate on working on your application or software without having to troubleshoot anything unrelated. Cost: Free trial available, but pricing details are unavailable as of this writing. Cloudways allows you to build PHP applications using a variety of more than 10 PHP-based frameworks as well as plain PHP. You can deploy your applications in just a few minutes, getting only the resources – RAM, storage, and CPU – you need. Cost: Pay-as-you-go-based pricing starting at $0.01 per hour. Free trials are available. Dokkur gives you an easy, fast, and convenient way to launch your app with just three steps: deploy your app, create a database, and connect the storage. You can manage to do all of these using a browser-based interface or using the Dokkur toolbelt. If you have Ruby on Rails applications and websites, then Engine Yard can help you put these up without having to manage your own servers. The company has ten years of experience with full-stack Ruby on Rails. Engine Yard offers their services by as much as 50% lower than AWS. You could get your Ruby on Rails projects up and running in 50% less time. Cost: Paid plans are billed at $0.03 per hour per instance. Force.com is part of App Cloud, an offering that allows you to build apps from Salesforce. With Force.com, you can create apps without having to write a single line of code. And the app you create on Force.com is ready for primetime: secure, connected, and mobile. Quickly automates your business processes. Even complex processes can easily be translated into an app. Cost: Free trial available. App Cloud starts at $25 per user per month (Employee Apps Starter). Its most expensive offering is the Heroku Enterprise Starter, which starts at $4,000 per company per month. And that's it for the first half of this compilation of the biggest PaaS players out there and what they offer. Stay tuned for Part 2, where we'll cover the remaining 17 vendors you should be aware of for your PaaS needs. Heroku vs. AWS: Which Is Best for Your Startup? PaaS or Container Services: Which One Is Right for You?